ProProfs Help Desk software is a customer support tool that enables teams to keep track of customer requests and effectively resolve issues. The tool is developed keeping in mind the need to deliver excellent customer service experience. This help desk ticketing system is powered by collaborative email which is widely used by businesses in ecommerce. Further, ProProfs help desk software is one of the most critical customer support tools for IT solution providers, airlines and travel websites too. Customer success managers (CSMs), help desk managers and system administrators need customer support software to manage client issues and requests effectively. ProProfs Help Desk is a customer support tool based on the cloud. This user-friendly software with email-like interface enables agents to efficiently track customer problems and resolve them in a timely fashion. Ticket management comes handy with the help desk software. Further, it helps businesses to reduce their support costs by integrating with their knowledge base. The help desk software comes integrated with Chat and Survey Maker as well. ProProfs Help Desk assists in converting customer issues into tickets when agents are offline. Further, it helps CSMs and system administrators to monitor their agents’ performance based on real-time customer feedback. The help desk ticketing system is feature-rich and comes with a plethora of functionalities that make it the first choice for businesses seeking customer support tools. 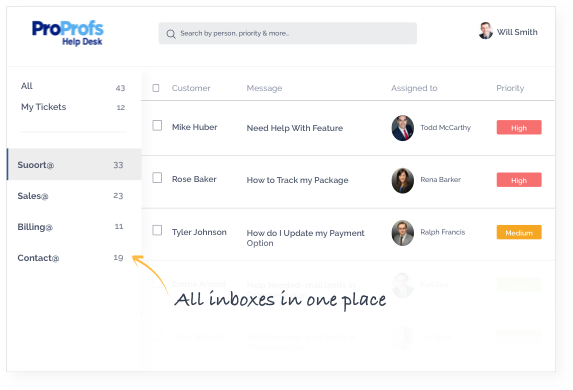 Shared inbox is one of the key features of ProProfs Help Desk. 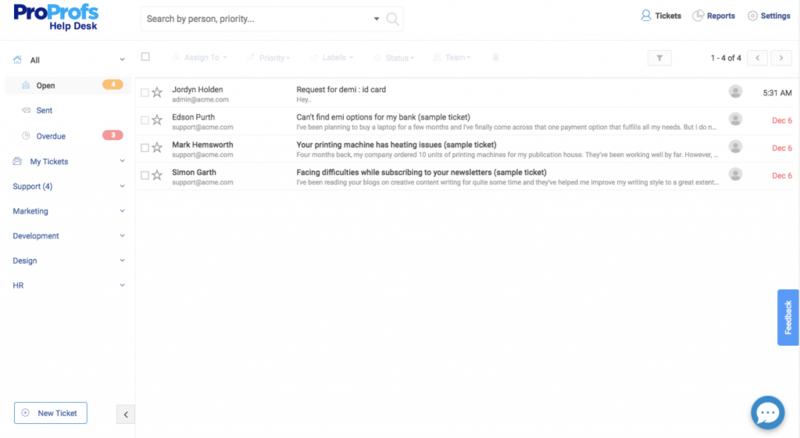 As the name suggests, various customer support and other teams can access this inbox and view tickets. Individuals across teams and departments can manage different customer-facing inboxes such as support@, sales@, help@, contact@ and billing@. Agents can track who is working on what. They would never miss out on a customer request and will be able to send timely responses to customers. Help desk ticketing is the single, intuitive system that provides agents – a smarter way to track and resolve issues. Shared inboxes enable agents to work collaboratively. Further, they can use collaboration features such as notes, child tickets, customer history and filters to track tickets quickly. Tickets can be resolved faster with prioritization, team commenting and canned responses. In addition, tickets can be assigned to a large number of people, who can view them and collaborate to send timely responses to customers. The help desk software tracks a ticket from start to finish. Businesses can effectively organize, prioritize, discuss and track customer queries, incidents and much more – all in one place. Tickets are not missed, lost, or left unresolved. System administrators can use filters to sort tickets by status, assignee, and milestone. The ability to create child tickets to track internal subtasks ensures that tickets are assigned to the concerned individual or team and resolved appropriately. 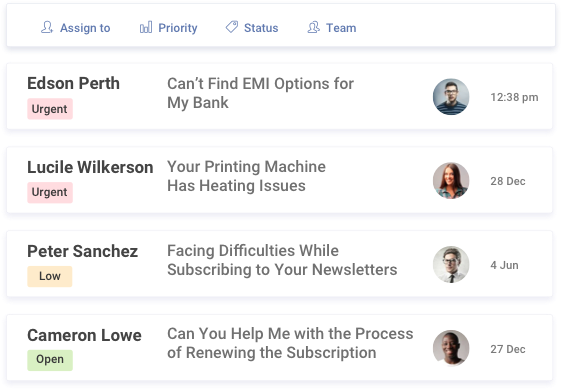 In addition, sub-tickets make it easy for agents to get inputs from different people and departments on any specific issue. Teams can review progress on issues anytime with ProProfs Help Desk. Canned responses constitute another essential feature of ProProfs Help Desk. You can send these rule-based automated messages to customers when you cannot provide the exact resolution to their issues. They can be sent when a ticket is created, updated, assigned and resolved. Automated messages even help you maintain brand consistency. The ProProfs help desk ticketing system comes integrated with Survey Maker. You can improve your agents’ performance by monitoring help desk ratings over time. Businesses may create customer surveys and NPS (Net Promoter Score) surveys using the survey tool. Measuring customer delight and capturing their feedback becomes easy and quick with this integration. 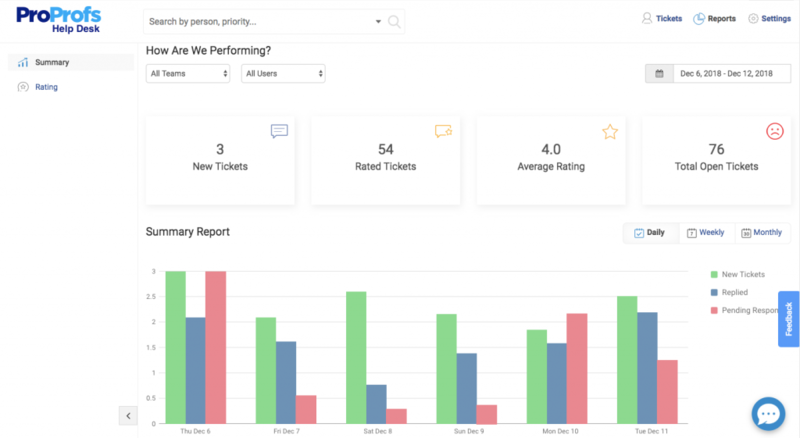 The help desk software lends you access to the “Reports” dashboard where you can see the summary, new tickets, rated tickets, average rating, and the total open tickets. The summary helps the system admin to gain insights into agents’ performance, whether more tickets are coming in than expected, the number of tickets that are replied to, customers’ rating of their experience with the customer support team and first response time. The best feature of ProProfs Help Desk is that it resolves tickets faster. When tickets are assigned to the concerned individual or team, there is no redundancy of efforts. Tickets are resolved promptly. Customers feel delighted when they get responses to their issues and requests on time. In addition, the collaborative email-like interface enables multiple teams and departments to work towards speedy ticket resolution. ProProfs Help Desk is available in multiple plans to meet varying business needs. Businesses may choose a plan that fits their requirements the best. Features change according to the plan. ProProfs Help Desk has been the leading help desk software till date. It has worked wonders for businesses of all sizes. The customer support tool has helped companies to simplify the job of their agents and delight customers. Most importantly, it has brought about a reduction in support costs with more efficient and productive customer support teams.